Dominant Controls - michael-rinderers Webseite! Instead of describing all processes in full detail, it is more informative to identify the dominant ones and learn what mechanisms govern them. Topographic controls on shallow groundwater levels in a steep, pre-alpine catchment – When is the steady state assumption valid? Topographic indices like the Topographic Wetness Index (TWI) have been used to predict spatial patterns of average groundwater levels and to model the dynamics of the saturated zone during events (e.g., TOPMODEL). However the assumptions underlying the use of the TWI in hydrological models are rarely tested. 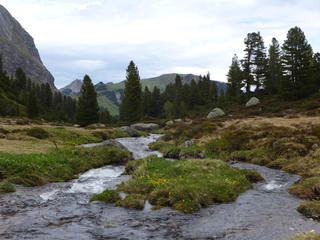 This study therefore evaluated the suitability of selected topographic indices to describe spatial groundwater level variations based on time series of 51 groundwater wells in a 20 ha catchment with low permeable soils in Switzerland. Results showed that median groundwater levels were correlated to local topography or the topography of the upslope contributing area. The correlation between TWI and groundwater levels changed over time. It decreased at the beginning of rainfall events, indicating large spatial differences in groundwater responses, and increased after peak flow, when groundwater levels could be considered as being spatially in a steady state. Is groundwater response timing in a pre-alpine catchment controlled more by topography or by rainfall? Groundwater levels in steep headwater catchments typically respond quickly to rainfall but the timing of the response may vary spatially across the catchment. In this study we investigated the topographic controls and the effect of rainfall and antecedent conditions on the groundwater response timing of 51 groundwater monitoring sites in a 20 ha pre-alpine catchment with low permeability soils. The median time to rise and median duration of recession for the 133 rainfall events were highly correlated to the topographic characteristics of the site and its upslope contributing area. The median time to rise depended more on the topographic characteristics than on the rainfall characteristics or antecedent soil wetness conditions. The rainfall threshold for groundwater initiation was also a function of TWI and allowed extrapolation of point measurements to the catchment scale. The stronger correlations between topographic indices and groundwater response timing in this study compared to previous studies suggest that surface topography affects the groundwater response timing in catchments with low permeability soils more than in catchments with more transmissive soils.